Keysight Technologies recently added two source/measure units (SMUs) to its N6700 Series modular power systems. The N6785A two-quadrant SMU is for battery drain analysis. The N6786A two-quadrant SMU is for functional test. Both SMUs provide power output up to 80 W.
The two new SMUs expand the popular N6780A Series SMU family by offering up to 4× more power than the previous models. The new models offer superior sourcing, measurement, and analysis so engineers can deliver the best possible battery life in their devices. The N6785A and N6786A SMUs allow engineers to test devices that require current up to 8 A, such as tablets, large smartphones, police/military handheld radios, and components of these devices. The N6780A Series SMUs eliminate the challenges of measuring dynamic currents with a feature called seamless measurement ranging. With seamless measurement ranging, engineers can precisely measure dynamic currents without any glitches or disruptions to the measurement. As the current drawn by the device under test (DUT) changes, the SMU automatically detects the change and switches to the current measurement range that will return the most precise measurement. When combined with the SMU’s built-in 18-bit digitizer, seamless measurement ranging enables unprecedented effective vertical resolution of ~28-bits. This capability lets users visualize current drain from nA to A in one pass. All data needed is presented in a single picture, which helps users unlock insights to deliver exceptional battery life. The new SMUs are a part of the N6700 modular power system, which consists of the N6700 low-profile mainframes for ATE applications and the N6705B DC power analyzer mainframe for R&D. The product family has four mainframes and more than 30 DC power modules, providing a complete spectrum of solutions, from R&D through design validation and manufacturing. 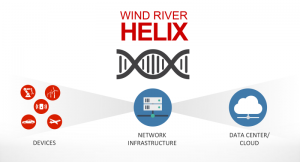 Wind River recently announced that it has enhanced and expanded its Wind River Helix product portfolio to address the system-level opportunities and challenges of the Internet of Things (IoT). In addition, the company has created an IoT professional services offering to assist customers with the creation and deployment of IoT applications. Wind River has added application and data services in the cloud to its industry-leading operating systems and IoT software platform via Wind River Edge Management System, its recently launched cloud-based technology stack that is an integral part of the Intel IoT Platform. The Edge Management System agent has been integrated with VxWorks real-time operating system (RTOS), Wind River Linux, and Wind River Intelligent Device Platform. 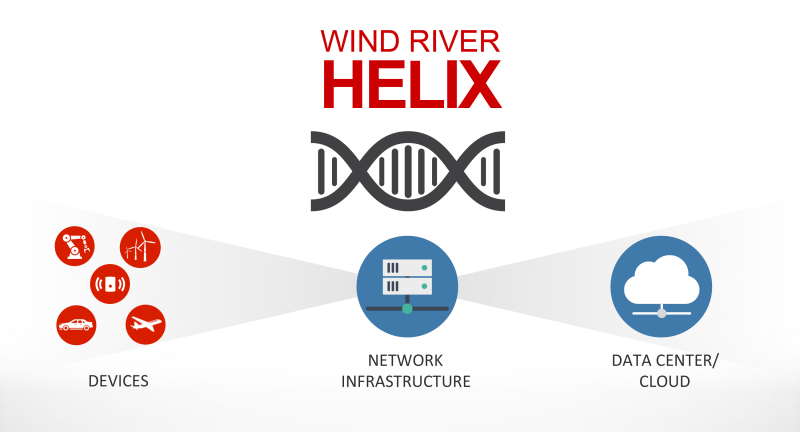 The agents bring secure cloud connectivity to Wind River products to facilitate data capture, rules-based data analysis and response, configuration, and file transfer. Specifically, these integrations provide device-level execution capabilities, remote management and provisioning capabilities at the gateway, as well as cloud-based delivery of software updates. This allows for seamless interaction with edge devices and simplified device-side application development. To complement its new IoT-enabled product portfolio, Wind River now has an IoT professional services offering to bring IoT concepts to critical infrastructure and other markets where safety and security are imperatives. The new offering will assist customers in configuring IoT systems and getting them to market faster with reduced risk and lower cost of ownership. Services include an IoT startup package, device agent configuration, application/agent interfacing, cloud applications development, and IoT safety and security requirements support. Further expanding its operating system suite, Wind River has also announced the availability of Microkernel Profile for VxWorks. The microkernel profile is a tiny-footprint RTOS to facilitate the creation of IoT-ready differentiated devices, such as sensor hubs, microcontrollers, and wearables, as well as High Performance Embedded Computing (HPEC) platforms to address intensive data processing. It is based on proven digital signal processing RTOS technology deployed in countless applications. These product additions and enhancements are the latest in a series of IoT-related updates to the company’s operating system suite, which include Security Profile for VxWorks, Virtualization Profile for VxWorks, and Security Profile for Wind River Linux. Cypress Semiconductor Corp. has announced a new high-performance programmable clock generator family that’s intended to simplify the design of consumer and networking systems. 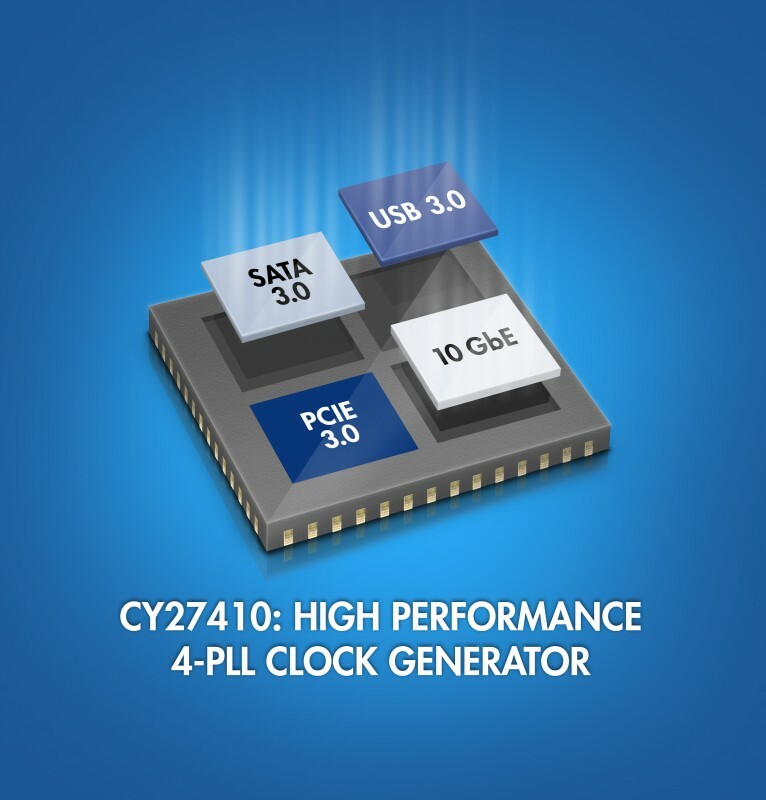 The new CY27410 4-PLL (phase-locked loop) clock generator can generate up to 12 programmable output frequencies on a single chip with superior jitter performance. The clock reduces both board space and BOM costs by consolidating system components to provide a flexible, low-cost solution. 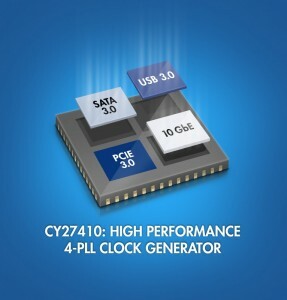 With support for frequencies up to 700 MHz and RMS phase jitter of 0.7 ps, the CY27410 family supports reference clocks for PCIe 1.0/2.0/3.0, SATA1.0/2.0, 10GbE, and USB1.0/2.0/3.0 peripherals. The devices support on-board programming using I2C interface, adding to design flexibility. They can also store up to eight different configuration settings that are selectable using external digital control pins. The family supports 12 single-ended clock outputs, as well as eight differential output pairs that can be configured as HCSL, LVPECL, LVDS, CML, or LVCMOS outputs. 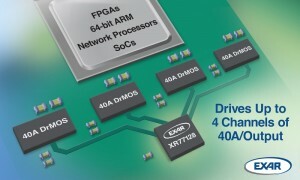 The devices also integrate a unique combination of value-added features that simplify design, including VCXO, glitch-free outputs, EMI-reduction, configurability as a zero or nonzero delay buffer, early/late clocks and PLL cascading. The CY27410 clocks come with the CY3679 evaluation kit and CyClockWizard 2.0 programming software to help designers create their desired frequencies and to easily check device performance. The CY27410 clock generators are currently sampling. Production expected in Q2 2015. The devices are available in a 48-pin QFN package. 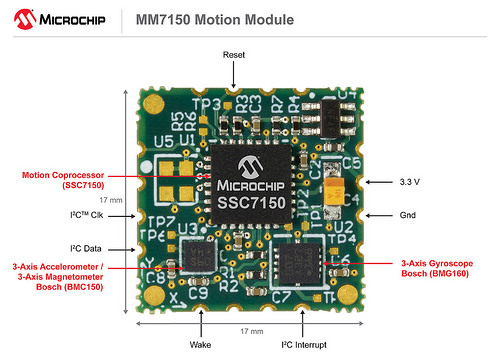 Microchip Technology announced at the Embedded World conference in Germany the MM7150 Motion Module, which combines Microchip’s SSC7150 motion co-processor combined with nine-axis sensors. 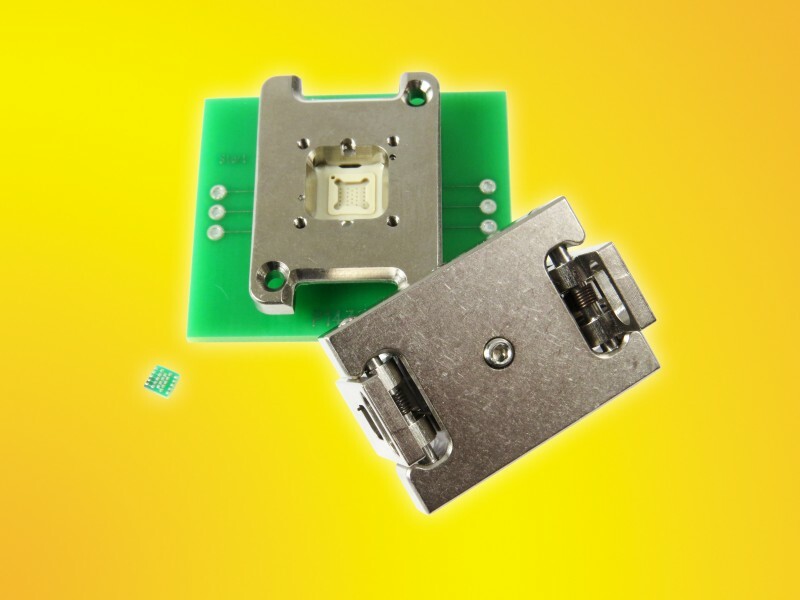 Included in compact form factor are an accelerometer, magnetometer, and gyroscope. With a simple I2C connection to most MCUs/MPUs, embedded applications and Internet of Things (IoT) systems can easily tap into the module’s advanced motion and position data. The SSC7150 motion co-processor is preprogrammed with sensor fusion algorithms that intelligently filter, compensate, and combine the raw sensor data to provide highly accurate position and orientation information. The small module self-calibrates during operation utilizing data from the prepopulated sensors—Bosch BMC150 (six-axis digital compass) and the BMG160 (three-axis gyroscope). The single-sided MM7150 motion module is easily soldered down during the manufacturing process. You can develop motion applications for a variety of products with Microchip’s MM7150 PICtail Plus Daughter Board. The MM7150 Motion Module is well suited for a wide range of applications: embedded (e.g., portable devices and robotics), industrial (e.g., commercial trucks, industrial automation, and patient tracking), and consumer electronics (e.g., IoT, remote controls, and wearable devices). The MM7150 is supported by the MM7150 PICtail Plus Daughter Board (AC243007, $50) that plugs directly into Microchip’s Explorer 16 Development Board (DM240001, $129) to enable quick and easy prototyping utilizing Microchip’s extensive installed base of PIC microcontrollers. The 17 mm × 17 mm MM7150 is priced at $26.76 each in 1,000-unit quantities. Fuzzy logic doesn’t necessarily need lots of horsepower. Many embedded applications that use more traditional control schemes can benefit from the use of fuzzy logic. Back in 1995, Jim Sibigtroth explained how to keep things simple and speedy. After describing basic fuzzy logic concepts, this article explains how to implement fuzzy-inference algorithms in a general-purpose embedded controller. The examples, written in assembly language, are for an MC68HC11, but the algorithms could be adapted for any general-purpose microcontroller. Code size is surprisingly small and execution time is fast enough to make fuzzy logic practical even in small embedded applications. Perhaps because of its strange sounding name, fuzzy logic is still having trouble getting accepted as a serious engineering tool in the United States. In Japan and Europe, the story is quite different. The Japanese culture seems to respect ambiguity, so it is considered an honor to have a product which includes fuzzy logic. Japanese consumers understand fuzzy logic as intelligence similar to that used in human decisions. In the US, engineers typically take the position that any control methodology without precise mathematical models is unworthy of serious consideration. In light of all the fuzzy success stories, this position is getting hard to defend. I think the European attitude is more appropriate. It recognizes fuzzy logic as a helpful tool and uses it. They regard the difficulties of the nomenclature as a separate problem. Since the term “fuzzy” has negative connotations, they simply don’t advertise that products include fuzzy logic. Figure l: Traditional sets are simply defined by their endpoints. Fuzzy sets add a second dimension to express the degree of truth (on the y-axis), which allows sets to be defined with gradual boundaries between false and true. Curiously, the results produced by fuzzy-logic systems are as precise and repeatable as those produced by respected traditional methods. Instead of indicating lack of precision, the term “fuzzy” more accurately refers to the way real-world sets have gradual boundaries. When we say “the temperature is warm,” there is not a specific temperature at which this expression goes from completely false to completely true. Instead, there is a gradual or fuzzy boundary, which requires a nonbinary description of truth. In fact, the fuzzy logic definition for a set contains more information than the conventional binary definition of a set. Read the entire article, which appeared in Circuit Cellar 56, 1995. 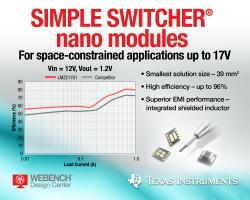 Texas Instruments has introduced four new SIMPLE SWITCHER nano power modules for space-constrained applications. The compact 17- and 5-V modules expand TI’s SIMPLE SWITCHER module portfolio to address 100-mA to 2-A industrial designs, such as servers, factory automation, test and measurement, and network security cameras. TI’s 17-V, 0.65-A LMZ21700 and 1-A LMZ21701—as well as the 5-V, 1-A LMZ20501 and 2-A LMZ20502 DC/DC power modules—achieve an overall solution size of up to 40% smaller than a discrete implementation. The modules combine high efficiency with high density and reduce EMI, even while operating at low power. All four modules enable designers to easily add more features and functionality to their systems in a smaller form factor, while speeding time to market.Watch a demonstration on how to create a high-density, multi-output design. Small solution sizes reduces board space by 40% when compared to discrete solutions. Low component count simplifies design and increases system reliability. Modules provide effective power management over the entire operating range. Low output ripple at less than 10 mVPP for noise sensitive rails. Low EMI complies with the CISPR 22 (Class B) radiated and conducted electromagnetic interference standard. Modules enable easy implementation of multiple power rail sequencing using Power Good pin. The four nano modules are available now in volume production. The LMZ21700 and LMZ21701 cost $1.55 and $1.75, respectively, in 1,000-unit quantities. The LMZ20501 and LMZ20502 cost $1.55 and $1.90, respectively, in 1,000-unit quantities. Linear Technology Corporation introduces the LTC2875, an exceptionally rugged, high-voltage-tolerant controller area network (CAN) transceiver to greatly reduce field failures without the need of costly external protection devices. In practical CAN systems, installation cross-wiring faults, ground voltage faults or lightning induced surge voltages can cause overvoltage conditions that exceed absolute maximum ratings of typical transceivers. The LTC2875 features ±60-V overvoltage fault and ±25-kV HBM ESD protection on the data transmission lines, protecting bus pins during operation and shutdown. Whether a circuit is transmitting, receiving or powered off, the LTC2875 tolerates any voltage within ±60 V without damage, increasing the robustness of typical CAN networks. CAN bus systems are becoming increasingly popular in industrial controls, instrumentation networks and automotive electronics. The CAN bus has a well defined protocol stack, with support for standalone controllers, FPGAs and ASICs, making implementation easier over alternative interfaces, such as RS-485. 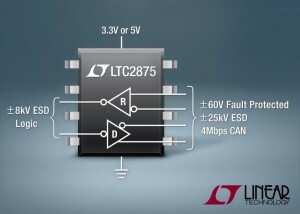 The LTC2875 provides the flexibility to be powered from a 3.3-V or 5-V rail, which is very useful in industrial applications where a 5V rail may not be present. In addition to the high fault and ESD protection, the device features a low electromagnetic emission (EME) driver with a transmit data (TXD) dominant timer to prevent faulty controllers from clamping the bus, as well as a high electromagnetic immunity (EMI) receiver with an extended ±36-V common mode range to enable operation in electrically noisy environments and in the presence of ground loops. The LTC2875 features a high speed data rate of 4 Mbps with an adjustable slew rate for data rates as low as 1 kbps. 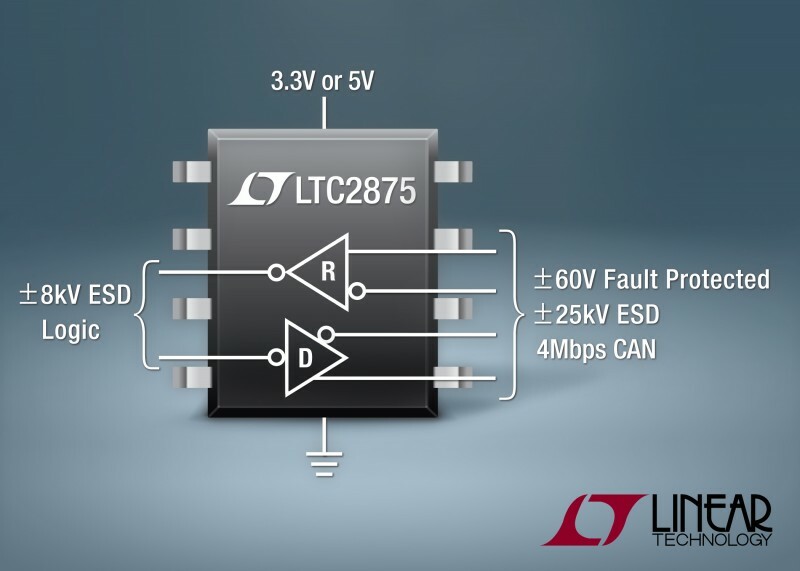 A shutdown mode brings all of the LTC2875’s outputs to high impedance and reduces power consumption to 1 µA. The LTC2875 is offered in commercial, industrial, automotive and military (–55°C to 125°C) temperature grades and is available in 3 mm × 3 mm DFN-8 and SO-8 packages, with industry-standard pinouts. Pricing starts at $1.72 each in 1,000-piece quantities. 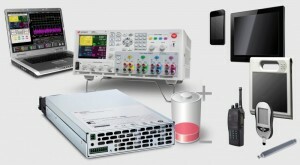 Keysight Technologies recently announced the E5080A ENA vector network analyzer (VNA), which offers a valuable combination of RF measurement performance and speed, enabling a 10× improvement in test time. 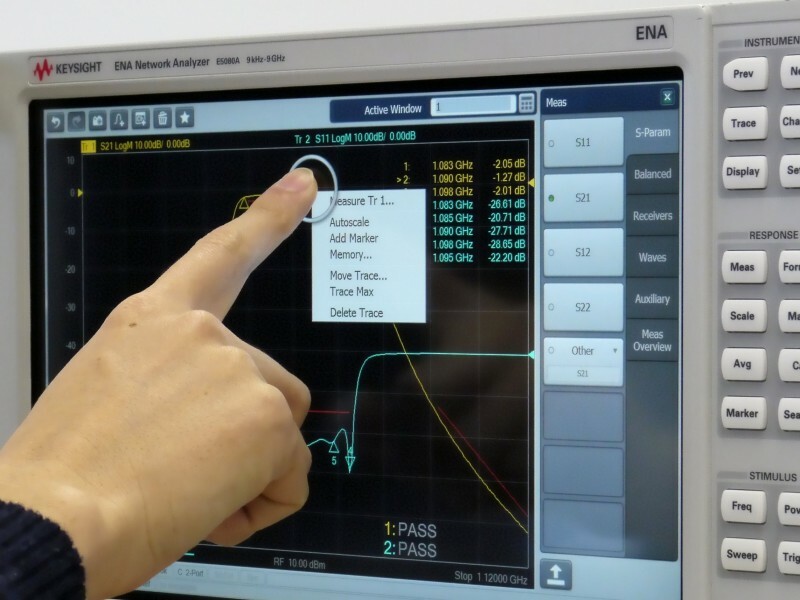 The new ENA uses the Keysight PNA- and PXI-Series software architecture, making it easier for engineers to take measurements across multiple Keysight VNAs. 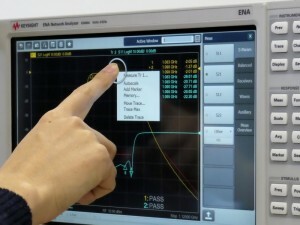 The ENA also offers a large color touchscreen display with fast access to basic measurements. The E5080A sets the new standard in RF component testing for R&D and manufacturing environments. The E5080A offers comprehensive functionalities for measuring active and passive component such as amplifiers, mixers, antennas, and cables, including balanced DUTs. Compared to the popular E5071C ENA, the E5080A offers performance advantages including more than 10 dB wider dynamic range (typically 147 dB) and up to 10× faster measurement speed in real-world test scenarios. These enhancements improve precision and throughput in the testing of RF components such as filters with deep rejection bands. Keysight is the first VNA vendor to provide a software platform that spans benchtop and PXI-based VNAs. This universal platform uses the best attributes and capabilities of the ENA and PNA families and delivers familiar functionality across all Keysight VNAs. With the new touch-based GUI capabilities, including tabbed softkeys and drag-and-drop operations, the E5080A streamlines measurement flow and helps engineers get better results in less time. Saelig Company recently announced the availability of the TBPS01-TBWA2 EMC Probe Kit (Singapore-based Tekbox Digital Solutions), which includes investigative near-field probes and a wideband amplifier to increase the versatility of economical spectrum analyzers to identify EMC issues. 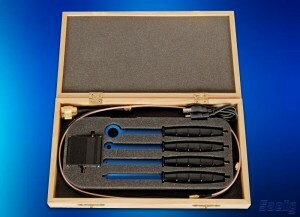 The TBPS01-TBWA2 EMC Probe Kit comprises four rubber-handled near-field probes (three H-field and one E-field), a 20- or a 40-dB wideband amplifier, and associated cables. The shielded probes have built-in ferrites and insulated rubber handles to insure that measurements are insensitive to the human hand. The H- or E-field probes are useful for detecting radiated emissions when placed near potential sources of electromagnetic radiation, and can help locate and identify interference issues in electronic assemblies and PCBs. Scanning the probe over the surface of a PCB assembly or housing quickly identifies locations which emit electromagnetic radiation. The probes act as wide bandwidth antennas, picking up radiated emissions from components, PCB traces, housing openings, or gaps—and from any other parts that could be emitting unwanted RF signals. The probes are usually connected to a spectrum analyzer but may also be used (less effectively) with the FFT capability of a digital oscilloscope. By changing to a probe with smaller size, the origination of the emissions can be further narrowed down. Engineers usually have to rely on experience and best-practice methods in order to design an EMC-compliant product. But when it comes time for compliance testing at an authorized test house many products fail first time through. Failing is expensive, and retesting costs are high too. The project schedule gets delayed and market introduction targets are missed. Therefore, it is essential for an engineer to do pre-compliance testing in-house to increase the chances of success when it comes time to book space in an anechoic chamber. One of the key components of an in-house pre-compliance test set-up is a spectrum analyzer. Entry-level models are now very affordable but the near-field antennas often are not. 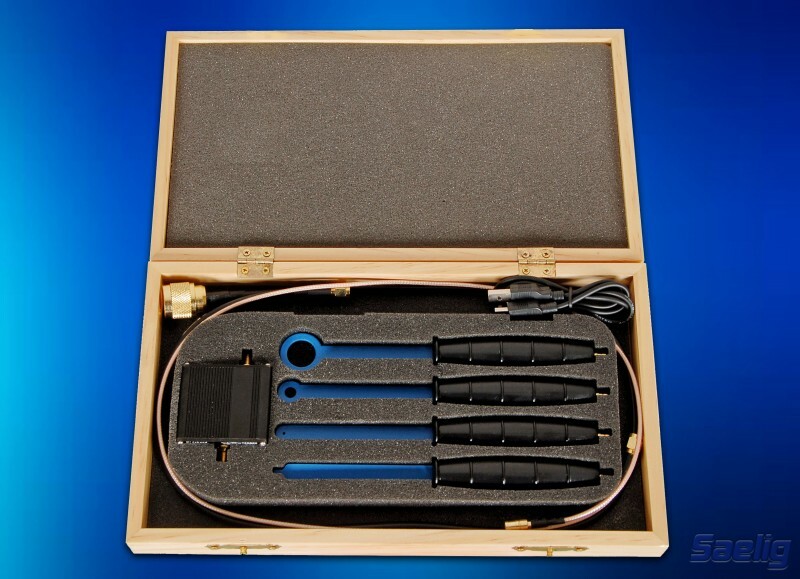 The TBPS01-TBWA2 EMC Probe Kit is an affordable antenna kit and amplifier that will enable any spectrum analyzer to be used to localize the origin of emissions or immunity compromises. Scanning the board with these hand-held probes will help identify problem areas, as well as the subsequent effectiveness of experimental solutions. An additional use of the probe kit with a signal generator is to identify PCB areas that are susceptible to RF interference by locally transmitting signals from the probes. The included USB-5V-powered TBWA2 Wideband Amplifier, housed in a compact metal box (1.9″ × 2.6″ × 1″) provides either 20- or 40-dB amplification (depending on model) with a flat response from 10 MHz to 3 GHz, increasing the sensitivity of near-field probe measurements when attached to a spectrum analyzer. Applications include radiated EMC measurements, contactless (load free) relative measurement of RF signal chains, contactless (load free) relative measurement of oscillators, modulators, RF immunity testing (by feeding a RF signal into the probe and radiating it into potentially susceptible circuit sections), noninvasive measurement of RF building blocks such as modulators or oscillators, and more. Eurotech recently announced the official release of Everyware Cloud 3.5 (EC), the M2M/IoT Integration Platform. The EC machine-to-machine (M2M) Integration Platform is intended to simplify device and data management by connecting distributed devices over secure and reliable cloud services. It enables you to connect, configure, and manage devices through the lifecycle, from deployment to retirement. With EC 3.5 a set of new remote features is available: device configuration, device control, device provisioning, and device update. These features enable the Everyware Cloud Web Console to be the single point of administration for all connected devices, and make the Everyware Cloud REST APIs the single programmable interface to remote devices. In addition, security and reliability are enhanced with Two-Factors-Authentication and platform Health Monitoring. You can try EC for free for 90 days. When talking about frequency mixers, “I/Q” has nothing to do with an intelligence quotient. As Robert explains, the “I” stands for “in phase” and the “Q” is for “in quadrature.” In this article, he introduces you to the fundamentals of I/Q signal representation and architecture. In 2012, I ended an article about frequency mixers (“Let’s Play with RF Frequency Mixers,” Circuit Cellar 263) by saying that I had only scratched the surface of the subject. In fact, I didn’t cover the important topic of so-called “I/Q” mixers in that article. If you’re wondering what “I/Q” means, let me explain. When talking about I/Q mixers, “I” stands for “in phase” and “Q” stands for “in quadrature.” You will find these two letters in most papers on signal processing or modern radio frequency (RF) systems architectures. Unfortunately, even some of the most experienced design engineers aren’t particularly familiar with these concepts. Why? Probably because they are usually presented in mathematical terms, such as complex numbers, the Euler theorem, complex Fourier transform, and so on. This month, my aim is to explain the fundamentals of I/Q signal representation and architecture without math. So, as usual, take a seat, breathe normally, and follow me. I’ll stay away from complex mathematics, except for a few concepts you probably learned in high school. A frequency mixer is a frequency translation device that you can use either to move up (up-convert) or down (down-convert) any part of the RF spectrum. For the moment, let’s focus on down-converters. Basically, a mixer is a voltage multiplier. It multiplies two voltages: the RF signal that you want to down-convert and a sine signal coming from a local oscillator (LO). The output is usually nicknamed “intermediate frequency” (IF). The magic lies behind a simple trigonometric formula. 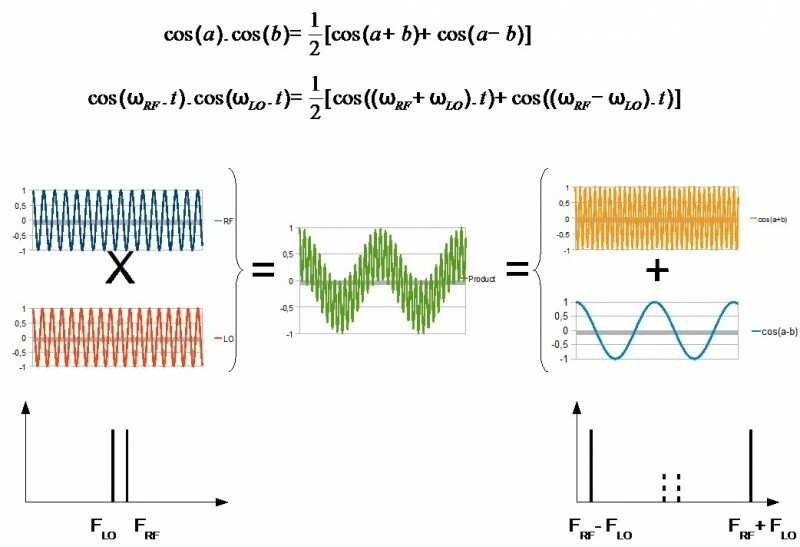 The product of two sine signals of frequencies F1 and F2 is the sum of two other sine signals. These two signals have respective frequencies F1 – F2 and F1 + F2. Figure 1 clearly illustrates what’s going on. Refer to my previous article if it’s unclear. 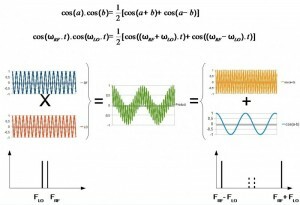 Figure 1: A mixer works by multiplying two sine signals of frequencies FRF and FLO. Thanks to the well-known trigonometric formula reminded here, the product is the sum of two other sine signals, respectively, at frequencies FRF + FLO and FRF – FLO. Of course, in real life, a mixer is a little more complex. But this description is sufficient enough for what I want to explain in this article. You must select the appropriate the LO and IF frequencies in order to have enough frequency separation between the two frequency terms present on the output. This enables you to remove the unwanted one with a frequency filter (high-pass or low-pass depending on the application). Now let’s move on to modulated signals. Assume that the input RF signal is not a simple sine wave but a modulated signal that occupies a total bandwidth of BW in hertz. The band of interest is then from FRF – BW/2 to FRF + BW/2, where FRF is the central frequency of the RF signal. For example, if it is a IEEE802.11g (i.e., Wi-Fi) signal on channel 6, then you will have FRF = 2.437 GHz (the center frequency of Wi-Fi’s channel 6) and BW = 20 MHz (the modulation width of 802.11g). So, in that case, the occupied bandwidth is 2.437 GHZ ±10 MHz. Suppose you want to translate the Wi-Fi signal to a low IF in order to digitize it. Assume that you want FIF = 50 MHz. As a mixer is operated in its linear region, it is theoretically transparent to the modulation. Therefore, you could simply mix the RF signal with a local oscillator set at a frequency of FLO = 2,437 + 50 = 2,487 MHz. The mixer’s output will include two copies of the modulated spectrum, one centered around FLO – FRF = 50 MHz and one centered around FLO + FRF = 4,924 MHz (see Figure 2). A low-pass filter will easily remove the second one. The signal’s occupied bandwidth is not modified by the mixer: the intermediate frequency signal will still occupies ±10 MHz around the intermediate frequency. Just a caution: You can see in Figure 2 that the spectrum of the modulated signal can be mirrored. This is due to the fact that the local oscillator frequency was set above the RF frequency. In that case, if the frequency of the RF signal increases, it comes closer to the LO frequency, and therefore the IF frequency is lower (as FIF = FLO – FRF). This shouldn’t be an issue as long as you’re aware of it. Such an architecture is called a “low IF” design, as the RF signal is moved directly to a quite low frequency in comparison to its bandwidth. Here the occupied bandwidth of the intermediate frequency will be 50 MHz ±10 MHz (i.e., from 40 to 60 MHz). Now imagine that you have a spectrum analyzer on the IF output and a hand on the frequency-setting knob on the local oscillator. What happens when you gently turn the knob and reduce the LO frequency? Refer to Figure 2 once again. If FLO comes closer to FRF then the generated FIF will be closer to 0 Hz. Theoretically, everything should stay fine until the local oscillator frequency is close to 10 MHz. At that point, the IF modulated signal will occupy the frequency bandwidth of 10 MHz ±10 MHz (i.e., from exactly 0 Hz up to 20 MHz). What happens if you continue to reduce the LO frequency? Part of the IF spectrum will be lower than 0 Hz. Unfortunately, negative frequencies don’t exist, so this spectrum will be folded back on the positive frequency side and will jeopardize the useful signal. Continue and set FLO exactly at the same frequency as FRF. Then the signal will be theoretically centered at 0 Hz. You will get an occupied bandwidth from DC to BW/2—that is, full of garbage, as the two parts of the spectrum will be folded on each other (see Figure 3). Figure 3: With a standard mixer issues arise when the LO frequency is too close to the RF frequency. The output signal then cross the 0-Hz boundary and its spectrum is folded back from DC to half the bandwidth, jeopardizing its content. You might think that this is bringing us nowhere, but there is even a name for such an RF architecture with the local oscillator exactly centered at the RF carrier frequency: zero-IF designs. So, is there a trick to avoid this spectrum fallback problem? You bet so. The answer is to use a so-called quadrature demodulator or I/Q mixer. You can analyze the concept in a few different ways. If you prefer math, read Richard Lyons’s excellent essay, “Quadrature Signals: Complex, But Not Complicated.” In what follows, I provide a more illustrative explanation. The complete article appears in Circuit Cellar 293 (December 2014). The ezLCD-405 5.6” VGA Smart, Touchscreen can be used as an intelligent display or as a standalone device, easy-to-use, command driven programmable firmware environment, and easy-to-customize your firmware with our free tools. The ezLCD-405 is based on the STMicro STM32F429 ARM M4 microcontroller. Also an optional ucLinux BSP is available. The arLCD by EarthMake.com is a Smart Touchscreen LCD combining an 3.5” Touchscreen, ezLCD GPU and the Arduino Uno designed for the maker market. WHY SHOULD CC READERS BE INTERESTED? 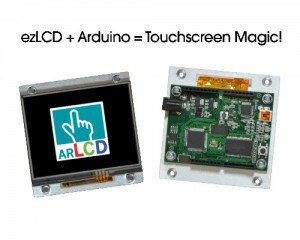 arLCD is a full smart ezLCD GPU with the Arduino Uno R3 on the same PCB in a thin, easy-to-integrate package. It can be used in many applications such as thermostat control, lighting controls, home security, audio control, water level gauge, robotics, and industrial automation. The arLCD combines the best of ezLCD-3xx and the Arduino UNO. The arLCD is not just an LCD and you should not confuse it with a snail’s pace 2.8 LCD shield that uses almost all your I/O pins! 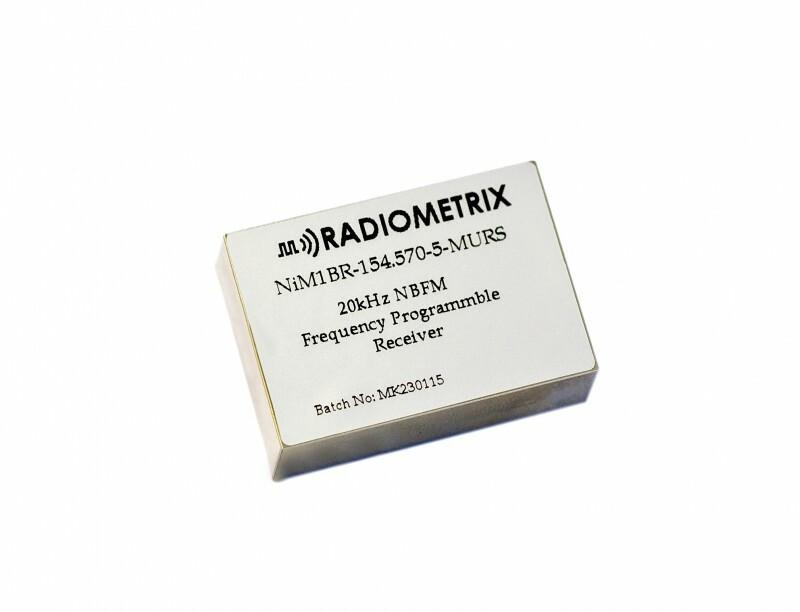 The new Multi-Use Radio Service (Mini-MURS) NiM1B-154.570-5-12.5-MURS is a frequency-programmable narrow band transceiver that offers a low-power, reliable data link in a Lemos /Radiometrix transceiver standard pinout and footprint. It’s suitable for licensed and unlicensed VHF allocations, FCC part 90 and part 95. 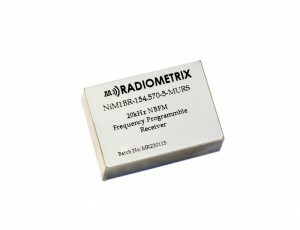 The transceiver’s features include the following: conforms to EN 300 220-3 and EN 301 489-3 (10-mW version only); compliant with FCC part 95 (MURS); standard frequency 154.570 MHz or 154.600 MHz (reprogrammable); data rates up to 5 kbps for standard module; usable range over 1 km; feature-rich interface (true analog and/or digital baseband); and more. Data bit rate: 5 kbps max. Ironwood Electronics recently introduced a new QFN socket addressing high performance requirements for testing QFN devices – CBT-QFN-7039. The contactor is a stamped spring pin with 17-g actuation force per ball and cycle life of 50,000 insertions. The self inductance of the contactor is 0.75 nH, insertion loss less than 1 dB at 31.7 GHz. The current capacity of each contactor is 1.5 A at 20°C temperature rise. 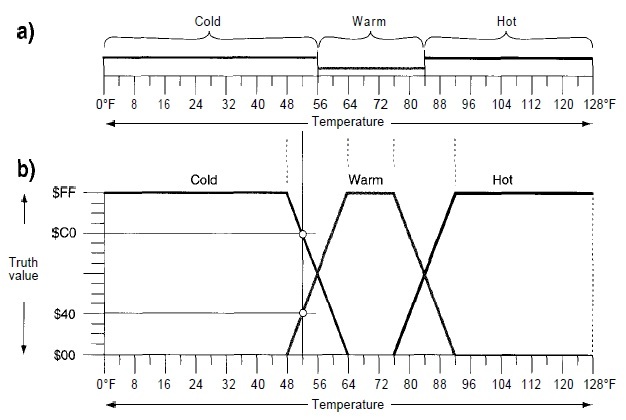 Socket temperature range is –55°C to 180°C. The socket also features an alignment guide for precise device to pin alignment. The specific configuration of the package to be tested in the CBT-QFN-7039 is a QFN, 3 × 3 mm, 0.5-mm pitch, 10 positions with center ground pad. The socket is mounted using supplied hardware on the target PCB with no soldering. To use, place the QFN device into the socket base and lock the double latch socket lid on to the base using the latch. The socket uses a compression wave spring to apply constant downward pressure enabling the device be interconnected to the target PCB. This socket can be used for hand test and quick device screening applications with the most stringent requirements. The CBT-QFN-7039 costs $552 with reduced pricing available depending on quantity required.